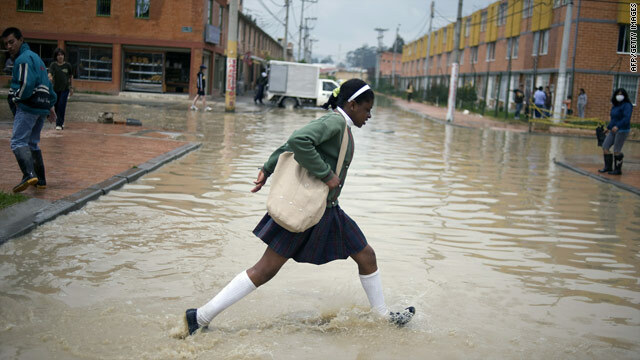 A girl crosses a flooded street in Bogota on Thursday during flooding that has affected 1.2 million people in Colombia. (CNN) -- Colombian President Juan Manuel Santos has declared a state of emergency in 28 of the nation's 32 departments because of heavy rains and flooding that have affected some 1.2 million people. He called on the international community to help and said the capacity of the Colombian government is overwhelmed. Flooding and mudslides have killed at least 136 people, injured 205 and left 20 missing, the nation's Interior and Justice Ministry reported. Emergency officials say the heavy rain has led to problems in 561 municipalities in the South American nation. "Many have lost everything they had and the capacity of the government [to help them] has been overwhelmed. We're trying to find ways to get more resources and that's why we're calling on the business sector, the public in general, and the international community to help us because, unfortunately, the situation is getting worse," said Santos. He declared the state of emergency after meeting Thursday with ministry officials. Santos made the announcement on national television, saying the declaration would help get aid to those who need it. The flooding has also damaged the nation's crops and livestock inventory, officials said. Meteorologists are predicting rain for the next two weeks over large parts of the country, with heavy downpours expected in the next few days.